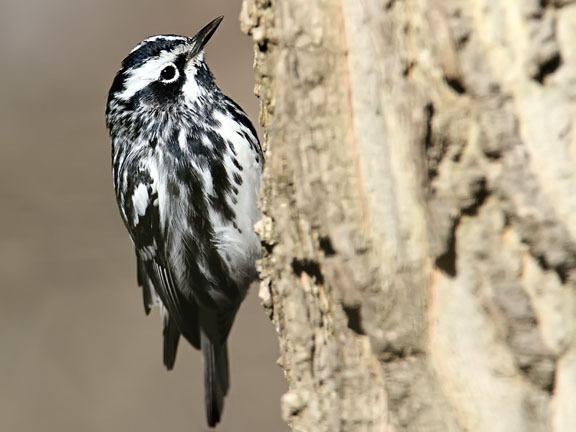 As its name would suggest, the black and white warbler is one of the least colorful of all North American warblers. 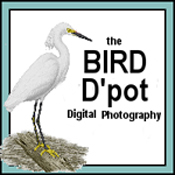 They nest across the eastern two thirds of Canada and eastern half of the United States. They migrate for the winter down into Florida, the Caribbean, Mexico, Central America and northern South America. Black and white warblers are gleaners. They glean, or pick, caterpillars, spiders, and other insects from trees. 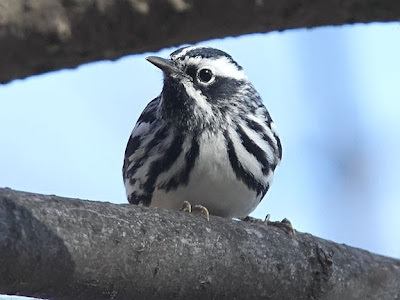 But unlike other warblers that typically glean their food from the trees leaves, the black and white warbler has long claws and a long hind toe that allow them to climb on the tree trunk and branches where they glean insects. They can be aggressive and attack other species of birds particularly other species that hunt similar parts of the tree such as nuthatches and chickadees. They may lack color but they are strikingly beautiful. I never saw this cute bird before. Beautiful photos! Oh wow, what a gorgeous bird again ! stripes pattern, so cool.